Why are there three different numbers for the amount of revisions I've made? And which one is real? The other day, I noticed I was getting close to the Copy Editor badge, based on the number of revisions I've made in my user profile. However, when the 500 mark arrived, and went, I still had no badge, so I went digging. 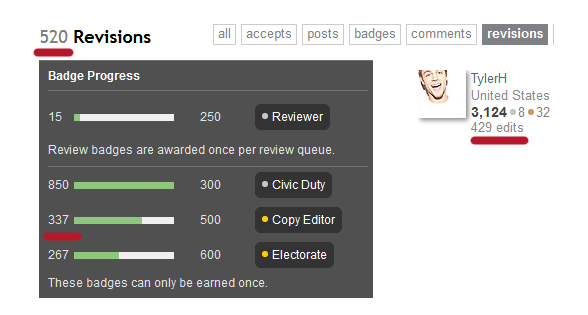 At first I thought, oh that says "Revisions", and the badge says "Edited 500 Posts". Maybe I've edited individual posts multiple times. After some more digging, however, I noticed some odd discrepancies. There are (to my knowledge, at least) three different ways a user can see their revision progress. For the badge, you can believe the counter in the review queue. The badge has specific constraints as to what edits count and the counter in the review queue takes those constraints into account. The revisions list in your review includes edits on your own posts, multiple edits on posts, and tag-only edits, so that count is higher. (sourced from the central badges FAQ). The editors tab adds all tag-only edits; so you made 429 - 337 = 92 tag-only edits on posts that are not your own. See What kind of edits are counted in /users?tab=editors? And the 520 count in your profile then adds edits on your own posts as well as count multiple revisions on the same post separately. Which I feel is more descriptive and useful in determining the requirements of the badge. This will be live in the next production build (meta: > rev 2014.10.16.2667, q&a: > rev 2014.10.16.1945). Not the answer you're looking for? Browse other questions tagged support bug status-bydesign edits badges . How many edits have I actually done? How I find number of post I edited so far? Why do the suggested edit counts in my profile differ from those on the review page? Why was the closing of this question so unusual? What's the best way to notify mods of answer sabotage? Why does 79 equal 85? Why are there three different numbers of votes cast in my profile? Should the post revision-related badges (e.g., Copy Editor and Strunk & White) be improved? Does my account run the risk of being banned because of someone else's excessive votes?